Are you looking to vacation in Mexico? Have you considered scuba diving from a liveaboard diveboat? If so, the answer to your travel destination may be the Baja Aggressor. Depending on the time of year you are going to travel, the Baja Aggressor takes two distinct itineraries, each providing amazing dive opportunities complete with some of the largest and most spectacular marine life in the Pacific. Don’t settle for another boring vacation in Mexico. From December till mid-June each year, the Baja Aggressor travels to the Revillagigedo Islands, referred to by many as the “little Galapagos” of Mexico. Here you will scuba dive at Socorro, one of the four volcanic islands that comprise this archipelago, enjoying pelagics and other diverse aquatic life. From mid-July to mid-November the Baja Aggressor travels to Isla Guadalupe, considered to be one of the premier locations in the world for spotting Great White Sharks and numerous other marine animals. 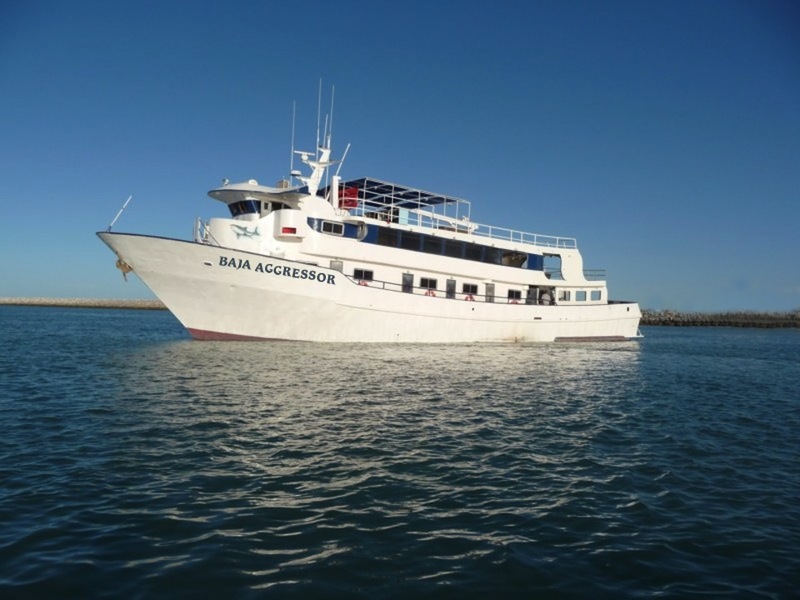 In addition to unmatched scuba diving, guests aboard the Baja Aggressor always enjoy excellent accommodations and delicious meals as part of their vacation package. Socorro Island, or Isla Socorro, lies some 294 miles (473 km) south of Cabo San Lucas at the southernmost tip of the Baja Peninsula in Mexico. During the months the Baja Aggressor travels to Socorro, you can expect beautiful, mostly sunny weather, and clear blue waters for diving. Air temperatures will range between 70° and 85°F (21-29°C), and water temperatures will average 70-78°F (21-25.5°C) with cool thermoclines. Because you will be making 3-4 dives each day, it is recommended that you wear a wetsuit, such as a 7mm wetsuit with a hooded vest, or a drysuit. Visibility on the dives is from 60 to 150 feet (18-45m) or more. Diving is done from pangas and may be considered challenging due to water conditions which can sometimes be choppy and contain currents. Prior to diving you must provide proof of certification. For the Socorro itinerary, the Baja Aggressor departs from the Marina del Rey in Cabo San Lucas the afternoon of the first day of the trip. 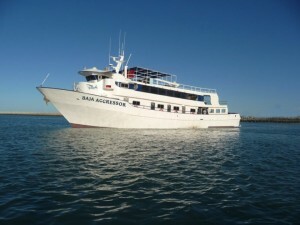 Because one full day of travel is required for both trips to and from Isla Socorro, you will spend eight nights aboard the Baja Aggressor, and enjoy five full days of diving once the boat reaches its destination. Night dives are not offered due to regulations. Pelagics are the main attraction for scuba diving at Socorro. Because of its location in open, ocean waters, Socorro attracts large concentrations of these big animals. Here you may dive with the friendly Giant Pacific Mantas who, completely on their own terms, may come in close and then swim alongside you. Acrobatic and graceful, Mantas move their wing-like pectoral fins to swim—fins that can span more than 23 feet (7m). Similarly, Bottlenose Dolphins may approach and interact with divers. You may also see a variety of sharks that can include Hammerheads, Galapagos, White-tip, and Silver-tip Sharks. Whale Sharks can be spotted both early and late during this dive season. Between January and March, the mighty Humpback Whales migrate into these waters. Divers may be fortunate enough to encounter these majestic creatures and also to hear the mating song of the males. From mid-July to mid-November the Baja Aggressor departs from Ensenada, Mexico and travels to Isla Guadalupe in the Pacific Ocean, some 249 miles (400 km) to the southwest. The waters around Isla Guadalupe contain one of the most prolific populations of White Sharks on earth, making this locale a premier destination for diving with Great White Sharks. Isla Guadalupe was recently designated a biosphere reserve so as to protect and support its ecosystem. On this trip, you will do all of your diving in a submersible shark cage. Non-divers will also have the opportunity to get up close to these magnificent predators. Between July and November daytime air temperatures average 71-75°F (21.6-24°C), with water temperatures averaging 65-70°F (18-21°C). It is recommended that you wear adequate thermal protection when diving, such as a 7mm wetsuit with a hood or a hooded vest, gloves and booties, or a dry suit for overall warmth. With crystal clear water, visibility often exceeds 100 feet (30m). Guests board the Baja Aggressor liveaboard dive boat on Saturday, after traveling from San Diego and Tijuana, where all guests must pass through Mexican Customs. The Baja Aggressor arrives at Isla Guadalupe on Sunday morning. After breakfast, the shark cave diving adventure begins and lasts until mid-day on Thursday when the return trip to Ensenada begins. If you plan on cage diving, you must provide proof of certification. Guests who are not certified may still enjoy the shark diving adventure from inside surface-oriented cages using a hookah system. The submersible cages each hold 3-4 people and have large openings at different heights so that all divers have optimum viewing conditions and opportunities to take photographs or shoot video. Two cages remain at surface level and one descends to 30 feet (9m). Guests will rotate through the cages so as to maximize everyone’s dive and shark viewing experience. The Great Whites will come in very close proximity of the cages, even bumping up against them. Although Isla Guadalupe is known as one of the best sites in the world to see Great White Sharks, scuba divers here will also have opportunities to experience many other varieties of marine life. You may find yourself swimming with curious, playful Sea Lions or any number of fish such as Calico Bass, Perch, and Chub. The currents may bring in Yellowtail Jacks, Yellowfin and Bluefin Tuna, and Abalone. Bottlenose Dolphins and Fur Seals can also be found here. Isla Guadalupe’s geography is equally impressive; rocky shorelines, high cliffs and bluffs, lava caves, and tubes all make the island’s volcanic origins very apparent.